In recent months, we’ve been learning more and more about what the OnePlus 7 could potentially look like and the features it may include, and with new leaked renders, we have an even better impression of this upcoming flagship handset. Oft-reliable leaker, @OnLeaks, has shared a number of very official looking renders (via Pricebaba) of what appears to be the imminent OnePlus flagship, as well as a 360-degree video showing it off in all its glory. As we’d previously predicted, the OnePlus 7 looks like it will have almost no bezels and get rid of the notch entirely, instead relegating the selfie camera to a small pop-up tab. The rear of the device sports three camera sensors and a flash, likely in order to handle depth-of-field and wide-angle effects. The handset’s other physical features remain largely unchanged from its predecessor (the OnePlus 6T), with a USB-C port, single down-firing speaker, volume rocker, power button and alert slider. As we have previously learned, the OnePlus 7 was the first phone to be confirmed to have 5G capabilities, thanks to its Qualcomm SnapDragon 855 chipset, although it likely won’t be featuring wireless charging. There is little else known for certain about the OnePlus 7, but rumors are pointing toward a 6.5-inch display with a 21:9 aspect ratio and a resolution that moves up from the company’s love of Full HD (hopefully to QHD or higher). It’s also unlikely that the 8GB of RAM found in its predecessor will be downgraded, and the battery is probably going to have to be increased to cope with the new processing and display demands. Unfortunately, all this points to a flagship phone that will cost considerably more than OnePlus has traditionally sold its handsets for, but we’ll have to wait for the official announcement for all to be revealed. Check out the official iPhone XS and iPhone XS Max marketing images from Apple shown at the top of this article: can you see the notch on the screen? Does it really matter? Do you think Apple is deliberately misleading people as to the screen size and format? According to a new lawsuit in the US, yes is the answer to that last question. As Business Insider reports, a woman from California has starting the process of suing Apple because she claims it wasn’t clear the iPhone XS had a screen notch when she bought it. It’s a case of “missing pixels” the lawsuit documents say. This case is still at the very early stages and it’s not yet clear just how strong the argument is either way – or whether a court would rule on it – but the way Apple hid the notch on its iPhone XS and iPhone XS Max promotional images did attract comment at the time. Most brushed it off as a clever marketing ploy. If the lawsuit succeeds though, this smart bit of marketing is going to cost Apple some cold hard cash. In many – though not all – of the images on Apple’s official iPhone site, phone wallpaper is used that conceals the presence of the notch. Further claims deeper in the lawsuit make note of the redundant pixels around the sides of the display where Apple has rounded the screen off – these make Apple’s pixel resolution claims false, the suit declares. The Apple website is “misleading” in the way it presents the new 2018 iPhones, according to the filed documents. 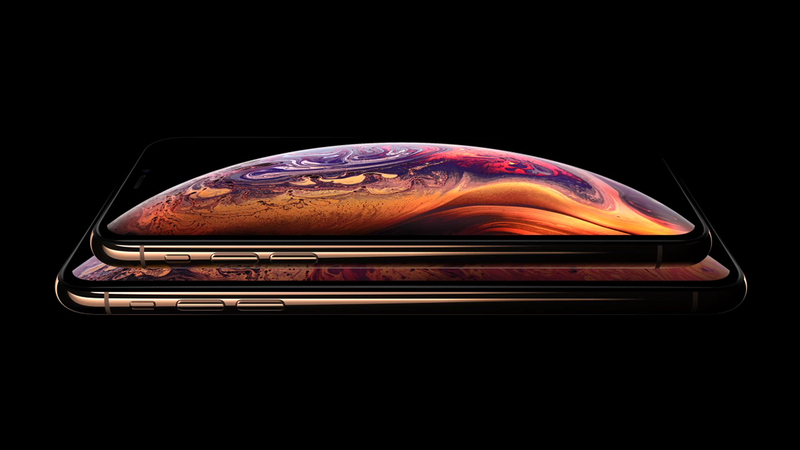 Trying to argue the case that you bought an iPhone XS or iPhone XS Max without actually realizing it had a notch is going to be difficult to argue – it doesn’t take much digging to find out – but it’s interesting that Apple’s promotional campaign has led to this. What’s worse than a huge notch at the top of your phone display? Try two notches! That’s exactly what some Pixel 3 XL owners are currently experiencing, with a new glitch plopping an additional ‘virtual’ notch on the screen of Google’s latest flagship device. As reported by Android Police, several users have noticed a bug which randomly places a side-mounted second notch on the Pixel 3 XL’s display, though unlike the very prominent hardware-based cutout at the top of the handset, this one exists solely in the digital realm. Though the phantom notch has so far only reared its ugly head in a few isolated instances, users have already taken to social media to post pictures of their bugged-out phone displays, including Kyle Gutschow (whose picture can be seen above) and UrAvgConsumer (seen below). According to several Reddit users who’ve experienced the software issue, the virtual notch does disappear after a restart of the device. Thankfully, Google is aware of the problem, telling Android Police that a fix for the ghastly glitch is “coming soon”. 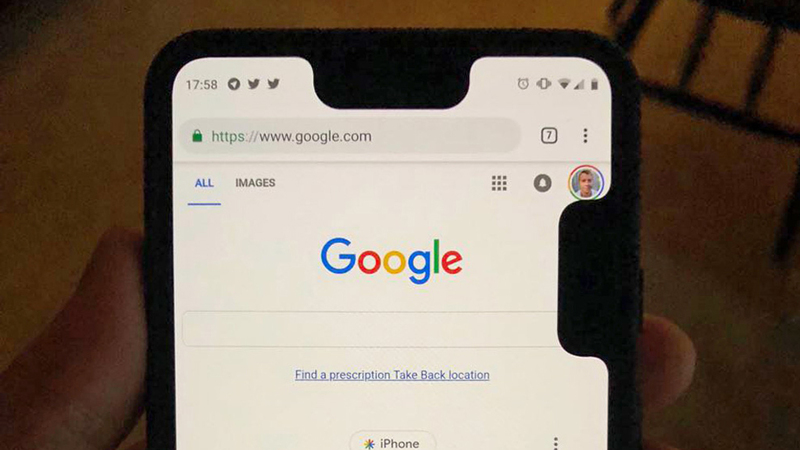 Though we’re not entirely sure why the Google Pixel 3 XL would even need a virtual notch cutout (especially one that doesn’t hold any speakers, cameras or other sensors), there’s no denying that it is indeed a funny sight. Horrifying, yes, but also funny. Header image courtesy of Kyle Gutschow. Notches don’t bother me, but Google’s strikes a nerve due to its lacking nature. So I decided to get rid of it myself. Even though I love almost everything about the Pixel 3 XL, you won’t find a notch on mine. Does it take away from the appearance? Sure, but I’d rather enjoy using my phone as I want than subjecting myself to a meaningless feature. That’s only the truth. Google didn’t do much of anything for its notch to be purposeful. The top-of-the-line model isn’t a slouch inside. Yet there wasn’t nearly enough done for its notch. Aside from storing a dual-camera setup, you have absolutely nothing to appreciate. Android’s not showcasing any special features or gestures with it, and most third-party apps don’t know how to handle it. Google made its name in software, so I can’t imagine what the excuse would be for leaving out any value-driving features for the notch on this flagship. Such a bummer, frankly. It could’ve been a notch to remember much like the iPhone’s. The look of the Mi Mix 2 wasn’t thrown away as that phone launched just six months ago. Xiaomi put one more letter in the Mi Mix 2S’ name to indicate it’s not a full-blown upgrade but rather a refined successor carrying the torch. If you put the Mi Mix 2S and Mi Mix 2 next to each other, you’d be lucky to pick up on the differences from the front. Once again, Xiaomi is embracing the edge-to-edge display life without the need for a notch at the top. The Mi Mix 2S might just have the thinnest bezels we’ve ever seen on a mainstream phone. Above and to the sides of the 5.9-inch Full HD+ (2160×1080) IPS LCD display is an ultra-thin border, and below you’ll find a somewhat noticeable chin. Xiaomi put the front-facing camera down there, which means the company didn’t have to borrow from Apple’s iPhone X like so many others have. Overall, you’re still getting a high-end look and feel. Certain parts of the Mi Mix 2S are also made of ceramic in addition to aluminum and glass. Many will criticize the Mi Mix 2S not for having a dual-camera setup but for aligning the lenses vertically with two-tone LED flash between them. That layout is, of course, used by Apple on its newest iPhone. But Xiaomi does push its own technology. The two 12MP lenses feature artificial intelligence, enhanced low-light performance, dual-pixel autofocus, multi-frame noise reduction, and four-axis optical image stabilization. It sounds fancy, but the truth is many flagships share the same qualities for their cameras. We should still applaud Xiaomi for not going light in this area anyway. Elsewhere, the phone is also no slouch. Xiaomi received a ton of praise in 2017 when the Mi Mix 2 arrived because the high-end components made for blazing-fast performance. The Mi Mix 2S only makes the experience better by using upgraded components. Again, it’s the same phone but tweaked with more advanced technology. It’s also worth sharing that the Mi Mix 2S supports wireless charging. To go with the phone, the company announced a 7.5W wireless charging pad that costs a mere $16. Xiaomi included the Snapdragon 845, which is Qualcomm’s flagship processor at the moment. Customers then choose memory and storage capacities. If you opt for 6GB of RAM, you’ll get to choose between 64GB or 128GB of storage. When you raise the bar to 8GB of RAM, you’re automatically getting 25tGB of storage. Pricing is higher than last year’s model, but the Mi Mix 2S remains less expensive than most cutting-edge phones out there. The starting price is $525 and climbs to $636 if you need the top offering. While the Mi Mix 2S will be available on April 3, don’t expect to see it everywhere. Xiaomi plans on selling it in China and select markets but not the U.S., though you’ll be able to use it anywhere since the Mi Mix 2S is compatible on various major networks around the world. The worst thing about smartphone announcements is that there are no more surprises. Nearly all of the information was leaked ahead of time for the iPhone X, Galaxy S9 and now Huawei’s P20 is suffering the same fate. We already have a good idea of what the phone is going to look like – there is a notch and a three camera system. However, the camera isn’t the only triple threat the P20 is featuring. According to a new leak from VentureBeat’s Evan Blass, Huawei’s P20 flagship will come in three different flavors. The three models Huawei is releasing include the P20 Lite, P20 and P20 Pro. The namesake lets you know where the devices stand. The Lite looks to be the lower-end model, the standard P20 will fall in the middle of the pack while the P20 will carry all the bells and whistles, including the three camera system. Judging from the image Blass leaked, Huawei seems to have kept the same design elements in all three versions: that is at the notch at the top, a substantial chin lives at the bottom and a vertical dual camera system adorns the back (with the P20 adding the third lens). The only noticeable difference between the three versions is the Lite’s fingerprint scanner is located on the back, while the other two versions having it located in the bottom chin. Unfortunately, the P20 Lite still has the same size chin, with only Huawei’s logo occupying the space. The P20 Lite also has a slightly bigger notch, but the difference is negligible. Huawei has an event scheduled for March 27 where it promises we will “see mooore.” That’s a pretty on the nose reminder that we will see three new P20 models and the fist-ever three camera system.